In May 2016, a cohort of musicians who share a connection with the late pianists Connie Crothers and Lennie Tristano took over the Outpost Performance Space in Albuquerque for two nights of intuitive improvisation. Among those remarkable musicians were pianist Carol Liebowitz and clarinetist Bill Payne, who together created music that was never heard before and would never be played again. Without sheet music or knowing what they were going to play before they played it, these two virtuosi created a set of unpredictable but coherent and affecting music that followed a logic based on the feeling of the moment. About 150 lucky individuals, including me, were in the audience that night for this daring excursion, and now the rest of the world can share it on the live recording, Spiderwebmandala. The nine tracks on the album draw from a variety of genres—classical, jazz, circus music, what-have-you—and covers ground that ranges from the impressionistic to the sharp edged, the mysterious to the celebratory, the lyrical to the concrete. Two of the tracks include spoken word contributions from poet Mark Weber—the album takes its name from one of his poems—who also produced the concert, along with Janet Simon and the Outpost’s executive director, Tom Guralnick. On the opener, “Deep Sky,” Payne’s clarinet zips around with the startling speed, sudden redirections, and magical accuracy of a hummingbird, his microtonal exactitude opening the subtlest shades of feeling. Liebowitz splashes lush and suddenly shifting swathes of color in tunefully dissonant arpeggios, like schools of tiny fish swirling in three-dimensional kaleidoscopic displays. Speaking of kaleidoscopes, “Spiderweb Mandala Flower Explosion Poem: Drishti,” inspired by the phantasmagoric Weber poem of the same name, opens with a wonderfully agitated section: water droplets on a hot skillet. The cat-and-mouse of “Secrets” probes at something hidden but offers the possibility of revelation. “Desert Dance” feels like the musical equivalent of myth: as reassuring as it is disquieting. On “Notes on a Dream,” the duo’s magical simultaneity and confluences reach a dazzling pinnacle. Payne goes pathfinding in an Ellingtonian wood in his solo, while on hers, Liebowitz explores deep harmonies that betray her classical training. On “Vanishing Point,” the two engage in an aerial dance free of gravity. The music on Spiderwebmandala is not easy. It requires listeners to relax both their ears and their expectations and give themself up to the flow. You won’t be humming this music at the end, but it may set you to humming. Go here for a closer look at these two musicians and their musical process. When it comes to progressive jazz piano, there are many worthy names on the current scene, but none are more satisfying to me than Carol Liebowitz. This is in part through her special affinity for duo exchange, with her playing on the recent First Set with saxophonist Nick Lyons a consistent grabber. This meeting with clarinetist Bill Payne is just as choice. They’ve recorded together before, on a sweet trio disc with violinist Eva Lindal in fact, and while the improvisations captured here (in live performance) surely benefit from familiarity, this CD offers chance-taking and surprise throughout. Additionally, on two selections, there is the added value of the post-Beat (think Snyder or Whalen) and utterly non-clichéd poetic syllables of Mark Weber. Over a year ago, I was first exposed to Carol’s highly original jazz, and found it to be totally delightful; it got high ratings, to be sure… on her upcoming September, 2018 release, her piano is complimented (very nicely, indeed) by clarinet from Bill Payne, as well as guest poetry from one of my favorite spoken-word artists, Mark Weber… just listen to Mark’s brilliant vocal interaction on the title track, “Spiderweb Mandala,” and you’ll be an instant believer in the power these folks convey. The oddly titled “Mixtures of Aroma in the Smoke” puts you right there in the thick of things, especially when Weber lays his marvelous and intriguing poetry in between the notes of the players! It is the longest performance on the album that got my vote for personal favorite of the nine songs offered up… “Notes on a Dream” allows you to aurally “see” their vision, and will spirit you (quickly) into the exciting ether of existence. I give Carol, Bill and Mark a MOST HIGHLY RECOMMENDED for this excellent aural adventure, with an “EQ” (energy quotient) rating of 4.99. Get more information about Carol and her projects on the Carol Liebowitz website. Sharing their free-form jazz stylings in tandem on and off since first pairing in 2010, pianist Carol Liebowitz and clarinetist Bill Payne joined forces with violinist Eva Lindal in 2015 for their widely acclaimed debut recording Payne Lindal Liebowitz. While technically a follow-up, Liebowitz and Payne’s provocatively titled Spiderwebmandala marks their debut recording as a duo. Quite expectedly, the live presentation by the duo at the Outpost Performance Space in Albuquerque NM is a master class in free jazz and spontaneous improvisation — with hints towards classical composers like Anton Webern, known for being an exponent of atonality and twelve-tone technique. Enhancing the shifting moods and intense rhythmic variations of the presentation are two pieces featuring the thoughtful spoken-word poetry of Mark Weber. 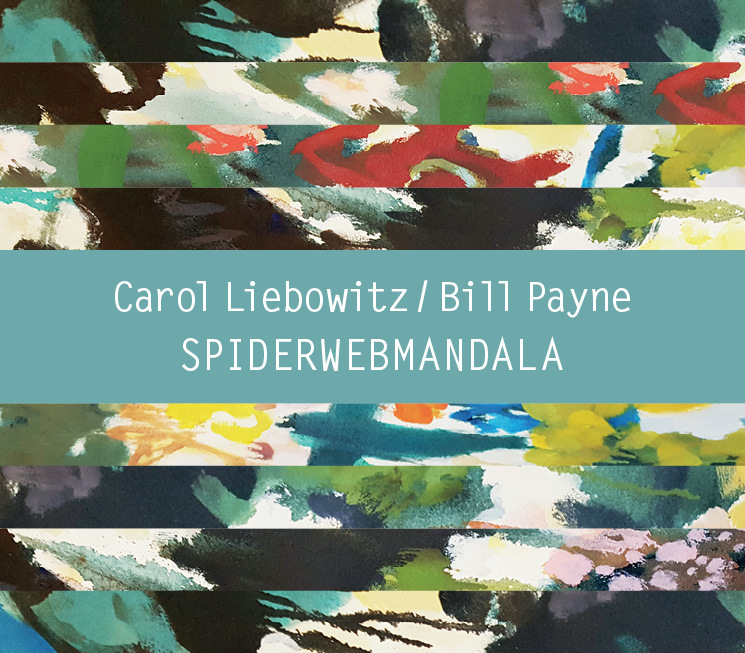 Difficult and dissonant, Carol Liebowitz and Bill Payne’s new album Spiderwebmandala is not the type of easy jazz you want to reserve for a rainy day. Liebowitz plays the piano and Payne plays the clarinet, and this series of duets was improvised on the fly during a live performance at the Output Performance Space in Albuquerque. Poet Mark Weber presided over the two-day event, and he punctuates these duets with his ethereal poetry. The overall effect provides many of the same challenges as much of free jazz, even when Liebowitz and Payne occasionally wander into somewhat recognizable melody structures that ease these songs into a more lyrical and softened state. The simple fact that this is just a piano and a clarinet in a live, open space helps to avoid the cacophony that free jazz sometimes creates. The simplicity of this ensemble allows you to climb into the notes from each instrument, and you’ll start to hear both the sophistication in Liebowitz’s style and the unique jazz timbre in Payne’s clarinet. It’s intriguing how the clarinet, through a seemingly spare progression of notes, can establish jazz themes and provide a firm foundation for the rest of the improvisation--it almost serves as the rhythm section and establishes the musical structures while the churning piano provides all of the dense and troubled emotions. The duo has been performing together since 2010, and their first release featured a trio ensemble that included violinist Eva Lindal--hence the eponymous title Payne Lindal Liebowitz. That 2015 release generated a lot of buzz for the three musicians and was actually voted one of the Top Ten Jazz CDs of the year in an NPR poll. This release is a tad more esoteric, perhaps because the violin might serve as a middle ground for the other two. Your appreciation for it might just depend on your personal relationship to the piano and the clarinet. In addition, both musicians are skilled at coaxing unique phrases that often mimic sounds in nature, and the rapid shifts in theme suggest animal behavior--which reminds me, of course, of Diane Moser’s Birdsongs. What makes a pure improvisation like this so special is the fact that it can’t be replicated. It can’t be taken out on tour. It is a fleeting, one-time occurrence that would have only been heard by the 150 people present in Albuquerque if it had not been recorded. I’ve been hearing more and more recordings like this lately, the flowing uncharted improvisations, the kind of music Keith Jarrett used to put out regularly. This type of music is daunting to novices, but the joy comes from deeply knowing the physical characteristics of these instruments and how musicians are inspired by them to produce something that’s truly one-of-a-kind. This new Line Art Records release is a new encounter with the American pianist Carol Liebowitz, a performer with classical training and a passion for improvised music. The duo is one of her favorite formats. Previously, we wrote about the duo of Liebowitz with saxophonist Nick Lyons (First Set, 2016), and with her current partner, clarinet player Bill Payne, Carol participated in the recording of the very first Line Art Records album — the trio Payne / Lindal / Liebowitz (2015), where they played with the Swedish violinist Eva Lindal. Now Carol and Bill, piano and clarinet, are left alone with each other and their own creative imagination. Actually, they were not alone. There was an audience: the album was recorded during their concert in Albuquerque, New Mexico, in the American southwest. And the energy of the hall, as it seems to me, actively fueled the creative imagination of the improvisors: applause after each track does not seem a simple tribute to politeness. Mathematics and music, of course, are closely related, but they are by no means identical. The duet of Liebowitz and Payne is a case where the sum of two components is not equivalent to their simple addition, it proved to be more. In the duet the interplay of the musicians has acquired a new quality. Bill’s clarinet sounds wonderful in “Desert Dance,” but it is the instant reaction of the pianist, the precise response of the piano, that makes the clarinet’s voice especially spirited. And a dramatic piano intro in “Tempest,” played in a purely academic manner, is followed at once by the wind instrument, merging in an inspiring improvisation. “Hidden Canyon” and “Secrets” seemed to me the pinnacles of this duet co-creation. And in two tracks, the title track and “Mixtures of Aroma in the Smoke,” the duo turns into a trio: the instruments of Payne and Liebowitz joined by the poetic words of Mark Weber. Poetry and improvisational jazz live, of course, according to their own laws. But it’s worth listening to how slowly and lyrically Payne’s clarinet echoes Weber’s voice in “Mixtures of Aroma in the Smoke” to agree with the organic nature of this combination. And as in previous reviews of the work of Liebowitz and Payne, now it is necessary to talk about the high intellectuality of their improvised music, infused not so much by jazz in its classical sense, but rather by academic music, especially the second Viennese school (Payne speaks directly about the impact of Webern's music on him). From jazz Carol and Bill take another, no less important property—the freedom of creative self-expression, born “here and now,” which comes from the music of the late Coltrane, Dolphy or Steve Lacy. The result in the form of the album SPIDERWEBMANDALA may interest people with very different, even polar tastes.